Still finishing off this leftover German Potato Salad, I decided it would be lovely with salty, crunchy samphire, some leaves (pea shoots, watercress and rocket), some lovely cherry tomatoes and a couple of rounds of black pudding which I'd not eaten at the weekend. Black Pudding is a sausage of pig blood and fat, often bulked out with rusk. The pudding I buy is a traditional recipe and very nice indeed. Squirt of HP Sauce on top and we've got dinner. Mrs doesn't like Black Pudding, so had much the same but with some sausages. After a long day competition Fencing ... home, I just want a few beers and a good, wholesome dinner. I have steak, I have some leftover German Potato Salad (made by a bona fide German) leftover from a picnic we had the other day and I've got some samphire. Super! So, onion, mushroom and samphire, cold German Potato Salad and steak. Knowing time would be limited this evening, I got myself ahead with some beef chunks, slowly cooked the day before ... nothing special, just a couple of bay leaves, the meat and covered with water, slow cooked at 125C for maybe four or five hours. Cooled overnight and ready to turn into something this evening I decided upon Japanese Curry, a simple dish of meat, vegetables and a flavour stock cube which is the key to the dish. Not having such a magical stock cube, I added my own flavours: beef stock, tamarind, black pepper, fish sauce, Worcestershire Sauce & Maggi Chilli Sauce. For vegetables, I added sliced carrots and some frozen peas. Cook through at 180C for about an hour and we're ready to eat ... just needing a quick thicken with some arrowroot at the end. Rather than rice, I served with chips ... yes, cooked in goose fat. Hispanic America, basically, a toasted tortilla loaded with great food! 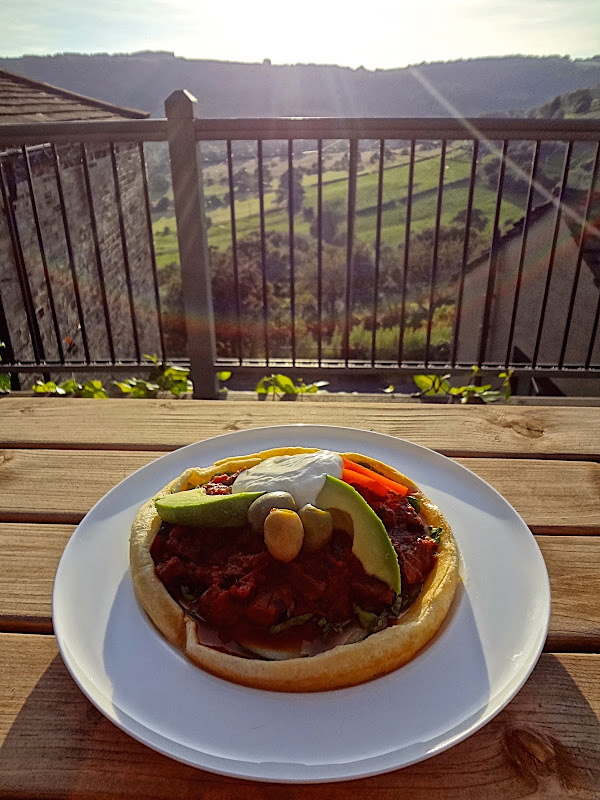 But, what's a Yorkshire Tostada? I do have a great recipe for Manioc Toritilla, but tonight I made up something quite impromptu, crossed my fingers and blow me down! It worked! It turned out more like a Yorkshire Pudding, but so what? 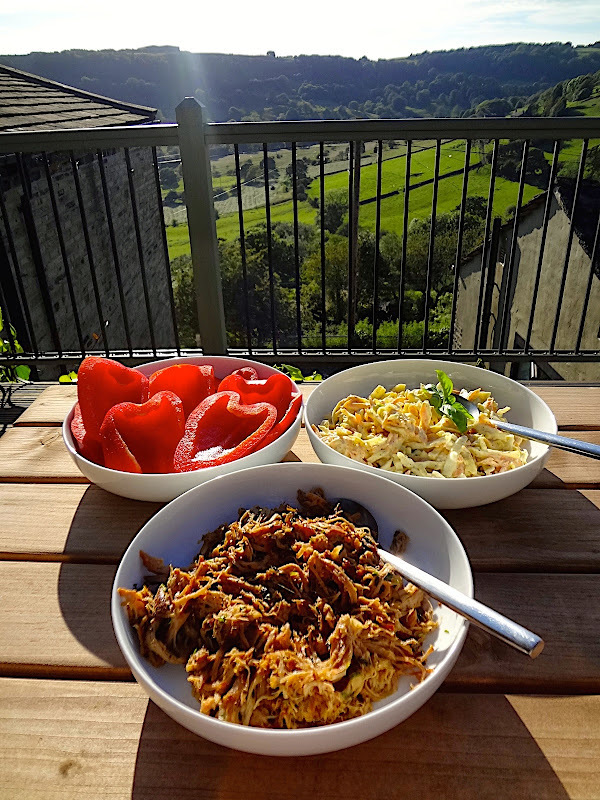 We have a tradition here in Yorkshire, which has spread nation-wide, if not world-wide, whereupon pretty much anything can be loaded into a "Yorkshire" and enjoyed. In a large skillet, brown off the diced beef (you'll want maybe 600g) in beef dripping. Meanwhile, peel and rough chop a regular onion, a red onion, three or four garlic cloves, some ginger and de-seed a few red chillies. Blend together. I used a hand blender. As the beef releases its liquid, slosh in some Worcestershire Sauce, add ground black pepper, ground coriander and some paprika. Allow the liquid to reduce, concentrating the flavours into the meat. Pour in your onion blend and fry off for a few minutes before adding in the chopped tomatoes (200g, or so, will do). Stir together and pour in some beef stock (maybe a pint, more if you like) and settle the skillet on a gentle simmer to cook through. Ideally, 3-4 will be perfect. If time is pressing, raise the heat to a gentle boil and keep topping up with water as the liquid reduced. Using 1 cup of flour per person (I used Sour Starch, usually used for those Brazilian Cheese Puffs), add in yoghurt and stir with a fork until a thick dough forms. Keep adding yoghurt until you get that consistency. Crack in an egg per person and whisk together. While whisking the batter sort of stiffens, but when you stop it relaxes into a pouring batter. Add a little sea salt and a teaspoon of baking powder per person, mix and leave to sit for a while. Prepare a couple of baking tins in the oven with some beef dripping, maybe 200C (400F? ), retrieve the tins and pour the batter in. Place in the oven for 20-30 minutes at 180C (350F?) until risen and not sticky, doughy in the middle. While the Yorkshire Puddings are cooking, shred up some lettuce, slice some cucumber, tomato, whatever you have to hand. Peel and slice an avocado. Reduce your Chilli and add in a good amount of chopped coriander just before serving. Ready? Place the Yorkshire Pudding in the middle of a round plate, border with sliced cucumber, load with shredded lettuce, some Chilli and crown with avocado, tomato, perhaps a few olives and a good slop of soured cream. Champion! As we say here in Yorkshire. Ox cheek is a tough muscle! It's a muscle that gets a lot of work, near constant chewing. Oven set to 125C and sitting in an oven-proof dish just covered with water, I let it cook all day - yes, something like 8 hours. * Boulangère Potatoes is a simple French dish, made by the bakers to use the remaining heat in their ovens. It's slices of potato, layered with salt, garlic and double cream. Cook 'til soft. ... and what a gorgeous evening. Family around and keen for a really easy dinner, I just bought in a load of chicken wings and a disposable BBQ. ... which was perhaps just a little hot, hence the title: Viking Funeral Chicken. In the heat, they'd got a little blackened, but no drama - it came away easily. As so, with our chicken firming on its journey to Valhalla we enjoyed the food with a simple crunchy salad of mixed lettuce, green pepper, cucumber and avocado. Fries alongside. Again, slathered in Discovery Chipotle Sauce, some paprika, black pepper, cayenne pepper and garlic powder, the first couple of hours at 180C really cooked this pork shoulder joint through. Dropping the heat to 125C for another three hours, the pork literally fell apart with little more than the press of a spoon. Shredded and settled into the fridge overnight, re-heated with a little water in a frying pan and some fresh herbs, we've got tonight's dinner already made. Just a simple coleslaw of white cabbage, grated carrot, grated cheese, shredded spring onion, Hellmann's Mayonnaise, Coleman's English Mustard and some black pepper and we're ready to eat! Hunting around my local supermarket, I spotted an absolute bargain on duck legs and came away with four large legs for £3! 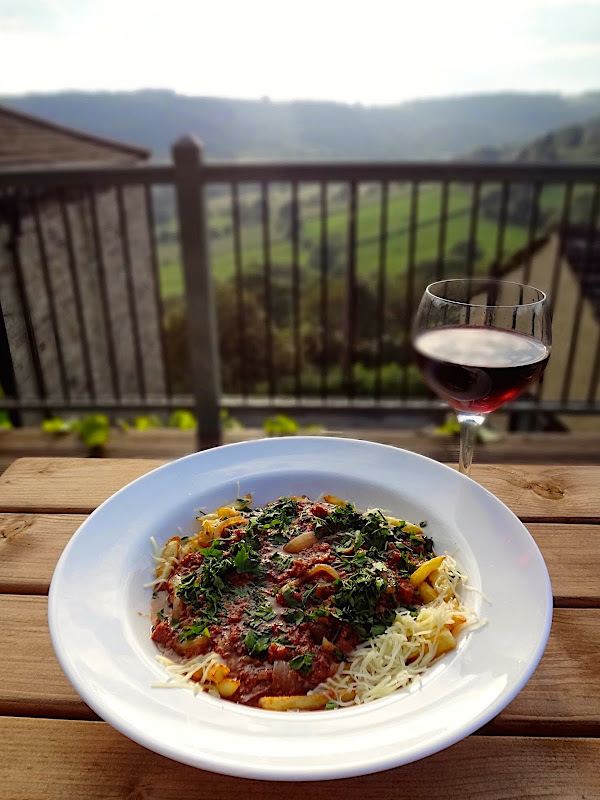 Yeah, I could do all that confit business and make up something really fly with restaurant presentation and so on ... but it's sunny outside and we'd rather sit on the deck looking out over the valley and enjoy an unpressured meal with a glass or two of red wine. ... served with a scattered salad of sweet red pepper, shaved fennel, avocado, cucumber, radish and spring onion (as a hint, there's no method there, just madness ... pretty much whatever salad ingredients I had in) and for wraps, good old British cos lettuce. It's a "use up" and "make it up as you go" kind of dish, which is pretty much how I cook, but this one is also curiously vegetarian. It is meat-less because I have no meat or fish available. And so, just a like a hunter/gatherer I have to do without when I don't have. All I did here was to gently fry off some butternut squash in goose fat, adding in some sliced courgette and cooking through until the squash had gone beyond firm while the courgette retained some firmness. I added a chilli, some black pepper and then turned out onto a plate tossing some avocado pieces over and some buffalo mozzarella. With a good splash of olive oil, some freshly milled black pepper, Icelandic ash salt, shredded spring onions and some freshly chopped parsley, the dish is ready. It was satisfying and it was good! Watching 'Diners, Drive-ins & Dives', Guy went north of the border to check out a Diner whose special was a Poutine with confit of duck leg. I actually do have some duck legs in, but they're for another night ... tonight, I want something really quick, really easy and really flavourful. Junk food, in essence, done right. So, tonight will be a Corned Beef Poutine. Corned Beef to us (the Brits) comes in cans which I believe foreigners call Bully Beef. Anyway, that's what I'm using. That will be poured over some skinny chips (fries, if you prefer) fried off in goose fat and the cheese, I'm improvising, will be a stringy Emmental. Melt some goose fat in a heavy-based skillet and drop in a shredded onion. Saute on for a few minutes until softened and then add in some slices mushrooms, black pepper and garlic powder. Stir through to ensure the fats are all soaked up by the mushrooms. Pour in about half a bottle of Guinness Original and sieve over a tablespoon of manioc flour. Set to reduce. Drop in cubed corned beef, shredded chillies and reduce slowly, seasoning with salt at the end. Peel and slice up potatoes into skinny chips, frying off in goose fat in a heavy-based skillet. French Fries down first, cheese on top and ladle the meat & gravy over. Yeah, another "not really a recipe" post. ... and so my dinner came together from what was being used, being moved around in the fridge to get other things and it ended up a simple dish of salad leaves, pickled beetroot, pickled onions, sweet potato wedges and smoked mackerel. Egg alongside, naturally. Immerse the salmon fillets into boiled water and keep no a very low heat for maybe 10-15 minutes. Meanwhile, slice and boil the potatoes, steaming the asparagus and peas over the top for the last 5 minutes of cooking. Retrieve the salmon from the poaching liquour, drain the potatoes, adding in a good knob of butter, black pepper and some shredded cos lettuce to warm through in the residual heat. Let out some soured cream with lemon juice and add a generous helping of chopped chives. Serve out, potatoes and lettuce down first, asparagus and peas and crown with gently flaked poached salmon, soured cream and chives spooned over.